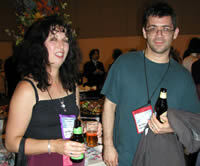 Liz Williams and Gordon van Gelder compare the merits of Sierra Nevada and Anchor Steam beers. 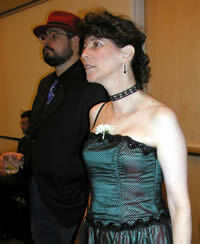 Janice Gleb, with Erik Olson in the background. 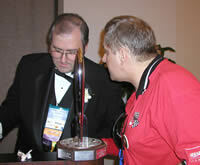 In conference - Kevin in discussion with photographer, Charles Mohapel. 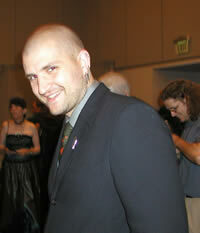 China Miéville in a relaxed mood. 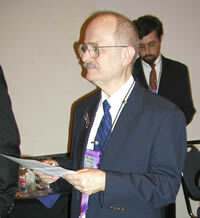 Vernor Vinge checks his notes. Top Talent - the Best Novel nominees. From the left: Robert Charles Wilson, China Miéville, Lois McMaster Bujold, Connie Willis, Charlie Stross (for Ken MacLeod) and Neil Gaiman. Pacific Rim: Australia's Sean McMullen joins Japan's Seiun presenters in California. 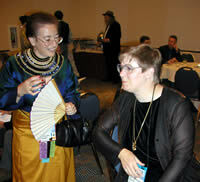 Giulia de Cesare explains the philosophy of Ploktaism to Lois McMaster Bujold. Checking the form guide - Neil considers whether it is worth the risk to put a dollar on two on Dave Langford. Charles Brown is dismayed at the odds on a Locus win.